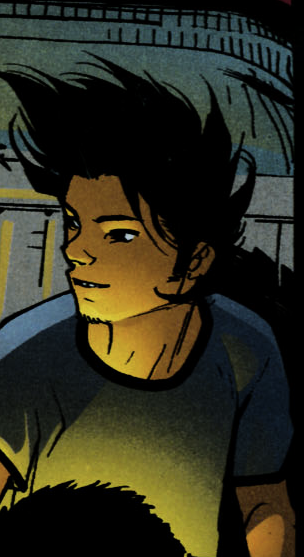 Physical description: By day, Jaime Reyes is a normal looking teenage boy. He has black hair that always looks like it has been a couple of months since its last cut, constantly getting in his eyes but not long enough to push behind his ears. He has dark brown eyes and Latino features, and an attempt at a beard that mostly looks like he forgot to shave that morning. He's slender — a less charitable person might call him scrawny — and not very tall, about 5'9". Although his armor protects him from the worst of it, he still has several scars and scratches, not to mention a big blue beetle fused to his spine (although you can't see that). When he transforms into the Blue Beetle, he is covered head to toe in futuristic blue and black armor, with the scarab, the source of all his powers, on his back. Although Jaime still looks very human as the Blue Beetle, his eyes are yellow and he wears a black full face mask with blue markings on the sides and top of his head, and around his eyes. Abilities: As Jaime Reyes, Jaime can run fast enough to get out of trouble and that's about it. But as the Blue Beetle, there's almost no limit to the destruction he can wreak. As Blue Beetle, he can create a pair of wings that let him fly, and his armor frequently changes itself into whatever he needs at the time—a shield, a knife, a particle cannon. But while Jaime may be the one in the suit, it's the scarab that actually creates the armor and it has a mind of its own! Jaime and the scarab are almost constantly arguing, because the scarab has a "wipe it off the face of the earth" mentality, and usually wants Jaime to kill whatever is attacking him and sometimes the surrounding area, or town. Therefore Jaime is constantly fighting the scarab to get it to only do non-lethal options. History: Jaime Reyes was born in El Paso, Texas to Alberto and Bianca Reyes. He and his little sister Milagro grew up with a loving family, his father ran a garage, and his mother was a ER nurse. Jaime was a good kid who worked hard and good pretty good grades, goofed off with his best friends Paco and Brenda, and tried to get his dad to let him work at the garage and stop pulling double shifts. Then while on his way to school with Brenda and Paco he found a blue scarab the size of his fist in a construction site. He took it home, and unknown to him, while he was sleeping that night it crawled into his back and fused itself to his spine. After that, he kept having weird dreams and seeing weird things — like a girl who had no eyes, even though he was the only one who saw that, or people where Brenda and Paco swore there was no one there. Those strange people turned out to be the Posse, a metahuman gang that noticed Jaime and wanted him to join them. When the scarab hurt one of the Posse who was trying to probe Jaime's mind, they attacked him, and he turned into the Blue Beetle — scaring the hell out of the Posse and Jaime as well. During that time, the Justice League was fighting Brother Eye, an evil supercomputer that Batman had built to keep an eye on all superheroes in case they ever went bad. (To be totally honest, I don't know the backstory, I only know what I read in Blue Beetle.) It had turned a bunch of people into mindless killing machines set on destroying every superhero in the database. The scarab was the only thing that could sense where Brother Eye was hiding — in a pocket dimension in space — and was also the only thing that could stop it. The Blue Beetle managed to destroy the mainframe keeping Brother Eye hidden and the Justice League defeated it, but when the Justice League was heading back to Earth, the scarab freaked out, saying that Green Lanterns were the enemy, and phased Blue Beetle out of sight, in the same way that Brother Eye had. Not noticing that Jaime was gone, the Justice League left, leaving Jaime floating in-between realities. Although Jaime thought it only took him a day to get home, it had been a full year. His family and friends had given him up for dead, and he began the sometimes easy, sometimes hard process of becoming part of their lives again. After that, Jaime became the El Paso superhero the Blue Beetle, keeping the peace in El Paso and Ciudad Juarez, since they are really one city separated by the US-Mexico border. For a while, his only major nemesis was La Dama, a crime lord (or crime lady) of El Paso, who just also happened to be his best friend Brenda's aunt and guardian. He acquired a slightly crazy mentor called the Peacemaker, who told Jaime that the scarab wasn't magical, it was alien—a piece of alien technology. Jaime found out exactly what the scarab really was when an alien race called the Reach came down to Earth. They said they came in peace, but Jaime had a suspicion that the Reach weren't all that they seemed, so he set out to figure out what the Reach really wanted, even if no one else believed him. His fears were proved well founded when he discovered that the Reach was planning on enslaving the planet—not by overthrowing the government or conquering the world, but by triggering a series of "natural" disasters that would cause governments to be totally dependent on the Reach's aid. The scarab was actually supposed to be a sleeper agent, signaling the Reach when Earth was ready to be taken. Jaime defeated the Reach by tricking them into letting the scarab access their mainframe, since the Reach thought of the scarab as just a piece of defective technology. The scarab, which Jaime knows has a will and a consciousness of its own, decided to help Jaime defeat the Reach, calling him "friend." Jaime is a sweet, generous, good hearted young man. He is fairly sarcastic, but never means to hurt anyone's feelings, just make them laugh. He has a strong sense of right and wrong due to his parents, who stressed the importance of responsibility and doing the right thing. He loves his family more than anything else in the world, even if his little sister likes to make fun of him all the time. He also speaks Spanish and English, although his Spanish is a little shaky at times and his cousins in Mexico City make fun of his pronunciation and border slang. Being a superhero is weird to Jaime. He's not totally sure that he really wants to do this, and he is often baffled by superhero conventions and tropes. He's constantly arguing with the scarab, because he believes in using only non-lethal moves, and the scarab usually starts by suggesting a tactical nuclear missile strike. He's not very good at keeping his secret identity secret, he usually blows it by answering "Yes?" when someone asks "Jaime?" no matter what he's wearing.